Funny money? Think again. There are lots of places -- and ways -- you can spend bitcoins. Here's are a few. The "five-dollar foot-long" Subway jingle isn't the same in bitcoins, especially when it's a weird total like 0.006 BTC. In any case, that's close to what it'll cost you for a BLT on 9-grain honey oat at a Subway location in Allentown, Penn. The shop owner, Sapan Shah, started accepting the currency three weeks ago. On an average day, maybe three customers use the virtual currency. But he's already made the process seamless -- as long as customers don't mind using the smartphone app Coinbase. 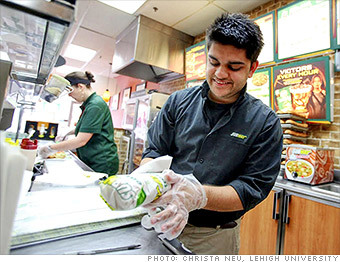 Shah is ecstatic that Subway corporate is open to his experiment. Still, bitcoins only get him so far. He still needs to convert them to cash every week to pay his bills.